Maintaining a database of cooling results allows us to create cooler matchups based on thermal load and noise-level testing on our Intel Core i7-5930K CPU clocked to 4.2Ghz and 1.20 vCore on our MSI X99S XPower AC motherboard nestled within a Corsair Graphite 760T chassis. We compared the Eissturm Hurricane against the EKWB RGB 240 kit, the Cooler Master MasterLiquid ML360R RGB and our bespoke Intel cooling loop. In a thermal load showdown separated by less than 2 degrees Celsius, the Eissturm Hurricane kit slid to the back of the group in a narrow margin across a quad-cooler matchup. Also noteworthy, the slightly higher motherboard power delivery temps are likely due to the triple 140mm radiator fans sitting outside the case, rather than directly above the voltage regulator heat sink. Those large 140mm Alphacool Eiswind spin much slower than the smaller, 120mm fans on the other cooling solutions, but they have a lot of work to do, moving air through the larger NexXxos 45 radiator. While pump RPM is relatively similar across the Alphacool, the Intel custom loop and RGB 240, it had little bearing on relevant performance since each uses a different pump model. Having the slowest moving fans typically results in the lowest registered noise levels, but when you have three large, fans spanning 140mm, you’re apt to cause enough turbulence to take notice. While our chart might seem to amplify the noise values of each, all are relatively normal in terms of decibel level readings. Our acoustic efficiency chart provides comparisons of thermal load performance against recorded noise levels produced. Since the values recorded amongst the comparison group in the load temperature sets were very close, as well as the noise level numbers, minor differences caused greater offsets in the above graph. Being able to cool well while also remaining quiet earns you gold stars here. Watercooling and liquid cooling in general is rarely a hobbyist venture one would consider frugal. That being said, each of our full watercooling solutions more than doubles the price of the Cooler Master MasterLiquid ML360R RGB cooler, with the Eissturm Hurricane Copper 45 3x 140 kit being the most budget-friendly at $326, which is still somewhat of an extraordinary bargain considering what you get. If you were to purchase all components of the Alphacool kit separately, the overall cost would be significantly higher. The radiator and pump/reservoir combo total over $225 if purchased individually. And you’d still be missing the CPU block, all 10 of the fittings, coolant, quick disconnect, tubing and three of the 140mm fans. As such, kit adds up to good financial sense (in a roundabout way). If you are going to buy custom watercooling components, why not do it all at once with a single click? Thermal imaging from our FLIR ONE Pro camera shows very even thermal dissipation from the radiator at both 50 percent and 100 percent fan speeds. Some heat soak is obvious at slower fan speeds, especially in the reservoir, tubing and the end tanks of the NexXxos 45 copper radiator. An intelligent fan curve for the radiator fans would be a wise configuration while leaving the VPP775 manual pump setting alone. With an enormous 3x 140mm radiator, this kit allows for enough thermal expansion of the loop to include a graphics card waterblock (or even two), if desired. By using industry standard G1/4 threaded fittings for all components, the cooling loop almost begs you to add more components to the party. A radiator of this size and potential allows for this kind of load because of the quality design and engineering that went into building it. A pump of this pedigree pushes coolant like few others are capable. Quality-milled components and attention to detail are seen on each and every piece within the kit. 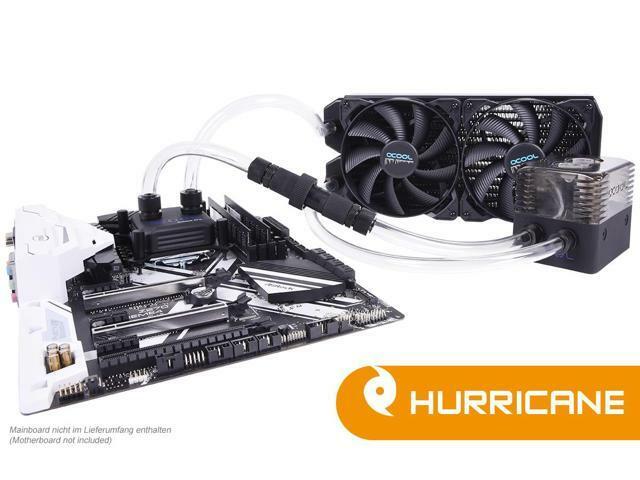 For anyone looking for a complete, high-quality watercooling kit in a single box, this Alphacool Eissturm Hurricane Copper 45 kit is an excellent choice for those with room in their chassis for the monstrous 3x 140mm radiator and large pump/reservoir combo. Worth it? Very much so. This cooling kit offers weapons-grade PC watercooling in a convenient, self-contained package. Seems more like an advertisement than a review. Is the pump replaceable down the road or do you have to replace the reservoir also to do that ? AIO the pump dies after 3yrs typically. Normally right after the warranty expires of course. The pump is removable as its own component. In fact, it has to be installed to the reservoir if you look at the early images - the pump is not attached to the reservoir. As this isn't an AIO, the pump being used is much more powerful and designed for a cooling system like this. The pump alone costs upwards of a typical AIO cooler in its entirety. I personally have one of the older D5 pumps on which this is based; it is still functional after almost 10 years. Please explain - what makes this seem like an advertisement? It is a product review - there is not any affiliation with Alphacool. I was wondering two things. One, why wasn't a proper case used that would fit this unit the way it was meant to be installed? Two, if you have it sitting on the outside like that, running the water lines into the case, why did you not use the provided holes that were there specifically for water lines. We use the same hardware for all the tests to provide the same environment for every cooler tested. If we change hardware, we introduce variables that do not allow us to make direct comparisons on coolers - which is what we're looking to achieve. The holes would be permanently removed since they are stamped into the case - they were left as-is to preserve the case and limit variables in all future testing. Interesting that the product pictures have a different pump/reservoir system than what you have pictured in the review. I'm not sure I follow - the pump and reservoir in the photos were from the box contents and were used for testing. Can you elaborate? We use the same hardware for all the tests to provide the same environment for every cooler tested. If we change hardware, we introduce variables that do not allow us to make direct comparisons on coolers - which is what we're looking to achieve. The holes would be permanently removed since they are stamped into the case - they were left as-is to preserve the case and limit variables in all future testing. I would think a radiator on the outside of the case would also affect results from those compared to ones that were on the inside. I understand you need to compare like for like (Intel kinda proved that, too). But to me, that means putting all units into a proper case that fits. Yes, that would mean much more testing, but as you pointed out, people that buy this are probably going to pair it with a case that can fit it properly. I don't know, just saying. Just my opinion. Black Friday is coming, and I'm wish listing a new system, including case and water cooling. The pictures, and the review, were based on a tri-140mm fan and rad set up. The link you provided for purchase is for a dual-140mm fan and rad system. I would think a radiator on the outside of the case would also affect results from those compared to ones that were on the inside. I understand you need to compare like for like (Intel kinda proved that, too). But to me, that means putting all units into a proper case that fits. Yes, that would mean much more testing, but as you pointed out, people that buy this are probably going to pair it with a case that can fit it properly. I don't know, just saying. Just my opinion. Black Friday is coming, and I'm wish listing a new system, including case and water cooling. To some degree, yes, you would be correct. By using the same hardware for every test, we at least have a baseline for every cooler without having to make a change to accommodate one specific cooler just for aesthetics. Also, keeping the same hardware still allows us to call out that the difference of fitment of one cooler to another. The link for purchase isn't added by me - but I'll have to get a hold of some folks in editorial to see if this can be corrected. A little ironic that the Eissturm has an anticyclonic built in. Are there waterblocks available that would cool the power components ? btw, I don't blame you for this because it would seem its a product's advertising manager at the factory fault. A little ironic that the Eissturm has an anticyclonic built in. Are there waterblocks available that would cool the power components ? Most high-performance pumps use an anti-cyclonic insert of some form - look at EKWB's kit pumps, they use both a foam insert as well as an acrylic paddle. Also, what do you mean by 'power components'? Meaning, the motherboard MOSFETs and VRMs? If so, i'm not certain - but much of the time these are explicitly motherboard-specific, however at times, there have been universal applications. Not all watercooling vendors pursue these specific blocks, though. https://c1.neweggimages.com/NeweggImage/ProductImage/AE... is what I see @ newegg https://img.purch.com/r/340x340/aHR0cDovL21lZGlhLmJlc3R... is on your "shopping suggestion" above the review btw, I don't blame you for this because it would seem its a product's advertising manager at the factory fault. Issue is that an incorrect item was linked, that's mostly the issue. I believe it is being corrected. I'd love to see a review of this versus the EK-Kit X360... I'm considering both for my new build. I wonder if this would fit in a Phanteks Evolv X case? I would actually really enjoy reviewing it. Usually vendors will reach out to us with items they wish to have reviews written for but I can say that the EK X360 would be just a larger version of the RGB 240 kit compared in this review (and done posted last week). The only real component differences between the EK kits are the pump - the X360 uses the DDC 3.2 Elite while the RGB 240 uses a D5 version. Both are excellent pumps; the DDC is more focused on head pressure over flow rate (although still very good) while the D5 is more flow rate focused over head pressure. Both do very, very well and are each cornerstone pumps in the watercooling world. Meanwhile, this Alphacool kit uses an updated model of the 755 which is essentially a newer 655 (D5) pump. It's been a real battle trying to figure out if the EK-Kit X360 and the AlphaCool Hurricane will fit in the case I have on the way... the Phanteks Evolv X (top of case, not front). I've had 50/50 opinions, some say yes, others no. The rad with the EK-X360 kit is 60mm thick, so that is out. If I went EK it would have to be the P360 but it's components are not as good as the X360. The thickness of the X360 at 60mm is unreal and you would almost need push/pull fans to make ultimate use of that radiator. 45mm is really a nice sweet spot for thickness and install support. Looks like the Phateks case states 65mm clearance in a top mounted radiator, which really limits your ability to mount a radiator+fans internally without motherboard interference. Otherwise between the EK P and X 360 kits, biggest difference other than radiator thickness is the pump used: D5 vs. DDC and that's kind of like either having a Ferrari or a Lamborghini. What I meant by that is it it's so overwhelmingly positive with the minor nitpick that it doesn't fit threadripper and it cost more than all in one it's just so glowingly positive. It doesn't come across like a normal review I mean maybe this thing is that awesome just totally awesome and that's why you came across like that. No real up or downside on the parts between those kits if you're doing comparison...just mostly radiator overall volume (due to thickness) and difference of D5 vs. DDC pump, which either are excellent parts. What I meant by that is it it's so overwhelmingly positive with the minor nitpick that it doesn't fit threadripper and it cost more than all in one it's just so glowingly positive. It doesn't come across like a normal review I mean maybe this thing is that awesome just totally awesome and that's why you came across like that. I'm a custom watercooling guy at heart and this sort of thing really appeals to me on a personal level. Sure, you can buy cheaper AIOs that do just about as well, but the market for a cooling kit like this vs. that of someone seeking an AIO are different. That's why I kind of wanted to compare the coolers in terms of performance and price, but they're meant for different mindsets; those looking for a bolt-on, setup-and-let-it-run solution and those looking for more of a 'relationship' with their PC. Let's face it, if you run a custom cooling loop, it takes love to want to put that much effort into it. To me, its worth it...I've been doing it 16+ years. I kind of agree that having it installed inside a case would have been better for the accuracy of results, though I can see why having the same case used across reviews is important too. Perhaps removing the 5.25" bays would have been better though. Even if they are riveted in, it seems like it would likely be possible to drill out the rivets and replace them with screws or bolts, so that the cage could be reinstalled when not using a large cooler like this. Improving cooling with water cooling seems to be the solution to these 120W and higher CPUs. I like the push with the fans instead of pull on the radiator too. Case engineering seems to be the biggest success outcome. But this is what I do to a case for cooling: At every case fan hole I install a fan, I cut the metal stamped grill out and if the hole is on the outside, I install a wire finger guard. On the cooling radiator, I cut out the top, leaving mounting tabs for the radiator and I install the radiator on top with the fans inside the case. I also compare the air flow with the side cover off and on and adjust it so that the air flow is not lower when the side cover is installed. I want to say also that I don't recommend any water block that has plastic pieces. They leak over time and they are a mess to clean up. The two piece metal blocks like this one are good. @rubix_1011, Have you ever tried to water cool these newer motherboard chip-sets? There is probably a small performance boost there if they have a separate water cooling system. Whether it's one of the AlphaCool Hurricane models or one of the EK kits, it seems on the Phanteks Evolv X (http://phanteks.com/Enthoo-Evolv-X.html) there's more room to put one or the other kits in the front rather than on the top of the case. In 2017, 'BitWit' in his You Tube video said the best temps he got on an OC'd CPU/GPU was when the rad/fans were in front of case blowing in and w/ an 'open' vid card, not a blower, and with 2 top exhaust fans. He only used the more typical, less expensive AIO cooler units. I don't know if his findings would stand up to more thorough scrutiny by others.